Real estate agent vs real estate broker: what's the difference? Real Estate Agent vs Broker: What’s in a Name? Why Become a Real Estate Broker vs Just an Agent? Though there is a lot of hard work involved, there are many benefits to becoming a real estate broker. Here are some of them. In order to open your own real estate firm, you have to be a licensed broker. There are two ways to run your own brokerage. You can either work alone and simply keep all commissions earned from your transactions, or you can recruit and hire other real estate agents or associate brokers to work under your license. In this case, those agents and associate brokers will split their commissions with you, the designated broker. Or, if you’re running a high-split firm, they will pay desk fees. If you don’t want to open your brokerage but are interested in mentoring and managing agents, that is an option as well. You can be a managing broker who oversees other agents and brokers. While having additional career options and responsibilities is great, most agents choose to become real estate brokers for a very simple reason. They can make a lot more money as brokers. Here’s a quick rundown of the differences in income for real estate agents and real estate brokers. If you don’t have an entrepreneurial streak or prefer the safety of working under another broker, then you can always work as an associate broker. While you more than likely won’t have any additional responsibilities at the brokerage, you can usually command a higher commission split from the managing broker than most real estate agents. The ability to run a property management company is another reason to get your broker’s license. By law, every property management firm must have a licensed real estate broker on staff. Since the investment market in rental properties is currently hot, property management can be a great additional revenue stream or a new career option. Since having your broker’s license means you’re probably more experienced and have completed more training that real estate agents, you can and should use this to market to new clients. For example, you might include highlights of the differences between real estate brokers and real estate agents in your listing presentation to new seller clients. What are the Different Responsibilities of a Real Estate Agent vs Broker? The main distinction between a real estate agent and real estate broker is that only a broker can own a real estate firm or manage agents. If you’re an agent, you’ll need to work under a sponsoring broker. This creates differences in day to day responsibilities, as our table below shows. Broker responsibilities also vary based on what type of broker you are. Here are the three main types of brokers. By law, every real estate agent and every real estate agency must be overseen and managed by a real estate broker. Legally speaking, that broker, called the designated broker, bears the legal responsibility for all transactions that agents working under them complete. Though they are legally responsible for the real estate brokerage, the amount of participation in the day-to-day running of a brokerage by designated brokers can vary. Some designated brokers take a more hands off approach and let others handle the daily operation of the brokerage. Others take a much more active role and hire and train agents, manage staff, or even work with clients who are buying or selling homes. Designated brokers who own the brokerage they are the designated broker for are sometimes called broker-owners as well. A managing broker on the other hand, is a real estate broker who manages a group of real estate agents or real estate associate brokers. 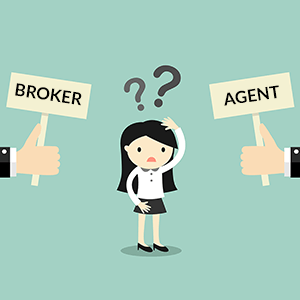 Some designated brokers work as the managing brokers at their agency while some hire other brokers to be the managing broker and take a more hands off approach to running the agency. As far as day-to-day operation of the brokerage, all managing brokers take a very active, hands-on role in running the brokerage. Also (rather confusingly) referred to as a “Broker Associate,” an associate broker is simply a real estate agent who has completed the coursework and work experience requirements, and passed a state licensing test to become a licensed real estate broker. Although this license allows them to open their own brokerage as a designated agent and manage other agents as a managing broker, associate brokers instead choose to work under another real estate broker. That means they have the exact same roles and responsibilities at a real estate agency that real estate agents do. They’re just more experienced and better educated than their real estate agent peers. Now that we’ve gone over the different types of real estate brokers, let’s take a look at some of the typical day-to-day responsibilities of real estate agents, designated brokers, managing brokers, and associate brokers at a real estate agency. The information we’ve covered so far should give you a better idea of whether you want to remain an agent or become a broker. If you want to become a broker, you’ll have to meet educational and experience requirements set by your state’s division of licensing. Here are the requirements to become a broker in California, Texas, New York, and Florida. To get an idea of just how much more experience a real estate broker has, let’s look at the requirements to become a real estate broker in New York. In order to become a real estate broker in New York, an agent needs to have worked as a real estate agent for two years and successfully complete a certain number of real estate transactions based on a point system. They need a total of 3500 points to qualify for a broker’s license. Representing either the buyer or the seller in a residential real estate sale is worth 250 points. Selling a commercial building or unit is worth 400 points. In order to complete the required 3500 points of experience to qualify for a broker’s license, a real estate agent in New York would have to complete fourteen residential sales, nine commercial sales, or a combination of residential sales, commercial sales, and rentals. After completing their real estate licensing course to get their real estate agent’s license, and accruing the necessary experience required in their state, real estate agents then need to take an additional real estate broker’s licensing course as well as pass their state’s broker’s licensing exam. The broker’s licensing course is usually roughly as long as the real estate agent’s pre-licensing course (45 hours in New York State) and covers similar topics. However, the broker’s licensing course goes into further detail and covers more advanced topics topics like how to run a real estate office, property management, business law, and construction and development. If you’re ready to move your career to the next level and become a broker, there is no time like the present. Since there are more and more new agents entering the profession every year, taking the steps to differentiate yourself can have a huge ROI almost immediately. We looked at all the top real estate schools and found Kaplan Real Estate Education offers the best licensing courses for real estate agents and real estate brokers. Their courses are more interactive, taught by industry veterans, and their online courses offer study groups and webinars that mimic a classroom experience. They also have the best reviews from students and some of the best graduation rates compared to other leading schools. Kaplan offers both agent and broker licensing courses in 20 states. They are our recommended online real estate school, and you can learn more on their site. If you’re still on the fence, check out our in-depth guide on how to become a real estate broker. Real estate brokers, whether designated brokers, managing brokers, or associate brokers, have more experience, undergo more training, and make more money than real estate agents. They are also the only real estate professionals who can open their own brokerage or property management firm. This post originally appeared on Fit Small Business. They would like to thank Kaplan Real Estate Education, a provider of online real estate courses, for sponsoring this article. Kaplan offers a great e-book on “Launching Your Real Estate Career” which can be downloaded for free here. All views expressed in this article belong exclusively to Fit Small Business. We are looking to sell our current home and buy a new house closer to my husband and I work. It’s good to know the difference between a real estate agent and a broker. I didn’t know that a broker can manage agents. If we hire an agent, they most likely work under a broker. I am genuinely delighted to read this website posts which carries tons of valuable data, thanks for providing such data.Probably one of the most informative I have read in a long time.